On her 109th birthday, Rosalie Esposito blows out candles on her cake. Things get better with age, so they say, but birthdays tend to remain the same, marked by the traditional celebratory functions. It was the stereotypical affair for a Bucks County woman who has long since passed the century mark. 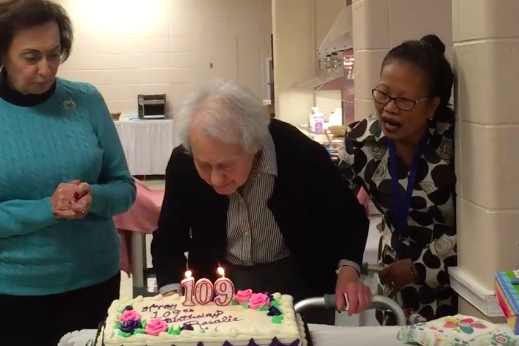 Enjoying festivities of cake, family and friends, Rosalie Esposito marked her 109th birthday Tuesday at Holy Redeemer D'Youville Manor in Yardley. “The only advice I can give is to love one another as families should do, and your friends, too, should be loved and cared for,” Esposito said. Esposito still trails the world's oldest person, Susannah Mushatt Jones, 116, originally of Alabama, by several years for the title. Born before the turn of the 20th century, Jones has attributed her long life to a diet of bacon and eggs each morning. Now, Esposito stands only 11 years from becoming president of the United States, according to the fictitious laws laid out by comedian Patton Oswalt. It should be noted that the below video contains very explicit language.